X-ray features around Quasar 4C37.43 reveal its high energy transaction with its surroundings. Credit: NASA/CXC/Univ. of Hawaii/A.Stockton et al. Once again a quasar exposes the limitations of archaic astronomy. Events around Quasar 4C37.43 point to electric currents in plasma, the one thing that is excluded in standard approaches to astrophysics. 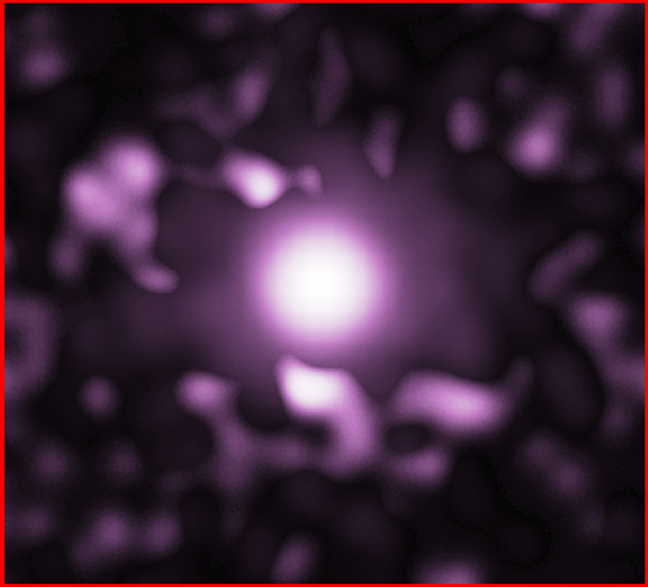 "Clouds of hot, X-ray producing gas detected by Chandra around the quasars 4C37.43 [shown above] and 3C249.1, provide strong evidence for galactic superwinds, where a quasar in the center of a galaxy has turned on and is expelling gas at high speeds. The X-ray features seen at five, six, ten and eleven o'clock … in the 4C37.43 image are located tens of thousands of light years from the central supermassive black hole that powers the quasar. They are likely due to shock waves in the superwind". "Mergers of galaxies are a possible cause for the ignition, or turn-on, of quasars. Computer simulations show that a galactic merger drives gas toward the central region where it triggers a burst of star formation and provides fuel for the growth of a central black hole. "The inflow of gas into the black hole releases tremendous energy, and a quasar is born. The power output of the quasar dwarfs that of the surrounding galaxy and pushes gas out of the galaxy in a galactic superwind". • the idea that charge separation in space is impossible and electricity, even if present, doesn't do anything. • the emissions are almost exclusively synchrotron radiation from fast electrons spiraling in magnetic fields, a characteristic of intergalactic Birkeland currents. If today astrophysics is to address the dramatic discoveries of recent years, there must be an eagerness to question assumptions and examine alternatives. The unlearning of things previously "known" may, in fact, prove to be the greatest challenge to the space sciences in our time. But without this openness, the tendency to protect one's specialized domain can only lead to more science by new release, as astrophysicists continue to elaborate outdated assumptions.